Rubinstein, C.V. et al. (2010) Early Middle Ordovician evidence for land plants in Argentina (eastern Gondwana). New Phytologist. Supplementary Figure 3 from the article, Color plate of cryptospores. 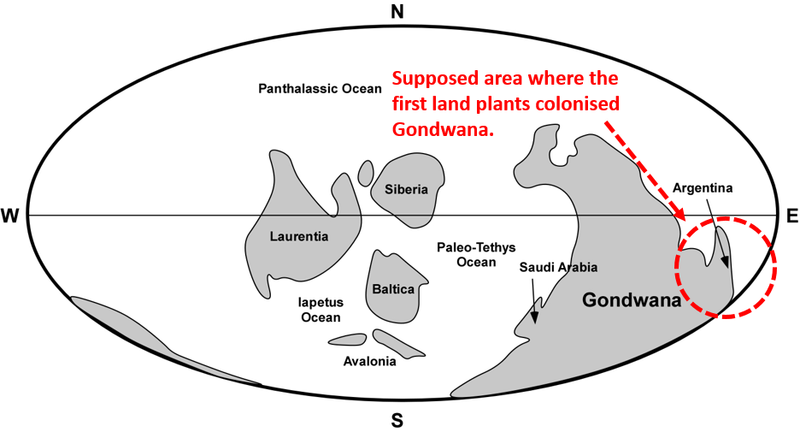 Modified supplementary Figure 4 from the article, Schematic Middle Ordovician paleogeographic map. This entry was posted in Biology, Geo and tagged colonisation, Fossil friday, liverworts, plant, spores. Bookmark the permalink.